UART Data Logger is software for monitoring activities of ports used by UART devices. Not only it allows you to monitor data exchanged between a device and an application via UART interface, you can also log it for further study and analysis. This information is critical for identifying potential problems while developing applications and drivers, testing and optimizing various devices. This UART monitor software also offers additional functionality such as advanced filters and search feature, data export and native Terminal. This is an entirely software solution that requires no hardware to function. It is available in three editions – Standard, Professional and Company. The software allows you to connect to any serial port in the system, even if it is already being in use by an application. With this UART monitor, you can start checking the port’s activities right away. Obtained data is logged in a real time mode; you can copy it to clipboard or create a separate file, if required. The data includes IOCTLs (input/output codes) and their detailed parameters. It is possible to observe activities of several RS232/ UART ports in one session, analyzing collected data is easy cause it is recorded on a first-in-first-out basis. Monitoring sessions can be saved, and you can load them whenever required. UART Sniffer provides four viewing modes – table, line, dump or terminal. Each of them presents data in a different way; choose the one that suits your requirements. Advanced filters help you view only relevant data. 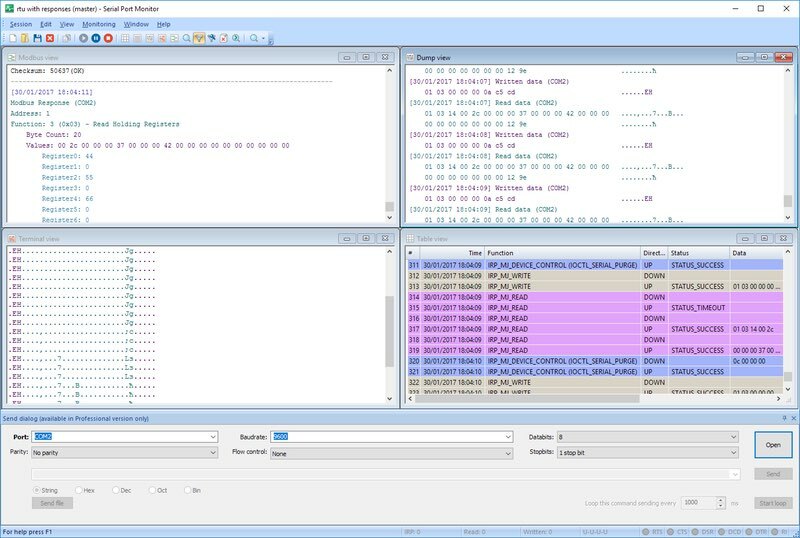 UART Analyzer emulates transferring data to a device on behalf of the monitored application. You can choose one of the following formats – string, binary, octal, decimal, hexadecimal or mixed. This is a good way of checking how a monitored device responds to a specific command. Work with all types of serial ports – standard on-board, extension board, virtual, Bluetooth, USB to SERIAL cradles, etc. Configure stopbits, flow control, parity control, data bits, highlighting, etc. Whether you're looking at redistributing our UART Data Logger technology as a part of your product or considering UART Data Logger software for an enterprise-wide deployment, we offer flexible and affordable corporate solutions designed to meet your needs. Ordering Source Code license for UART Data Logger you receive all extensively commented programming source code (GUI sources are not included). Our leading developers will help you implement Source codes and understand the advanced part of the product. Unlimited Site License grants you the right to install and utilize UART Data Logger application with GUI on unlimited number of computers by all workers of your company worldwide. It is the ideal solution if your company has representation offices in the different parts of the world. If you know the certain number of computers to be equipped with UART Data Logger you may consider obtaining Limited Site License. The advantage of Site Licensing comparing to multiple Single licenses is one license key for all company computers. With UART Data Logger by Eltima Software I have easily managed to develop a useful tool for logging and debugging and even embedded it into my own software. UART Data Logger allowed the analysis which would be impossible any other way. I was using your product to investigate the protocol which PC software uses to communicate with a mobile phone so I could get my SMS control device to do the same thing.